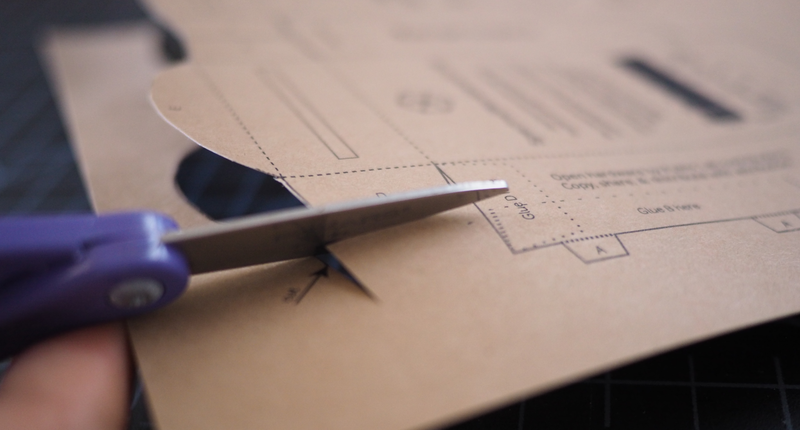 After a few years, we're returning to one of our oldest kits to update and improve it, building on lots of community-contributed ideas, improvements, and refinements. 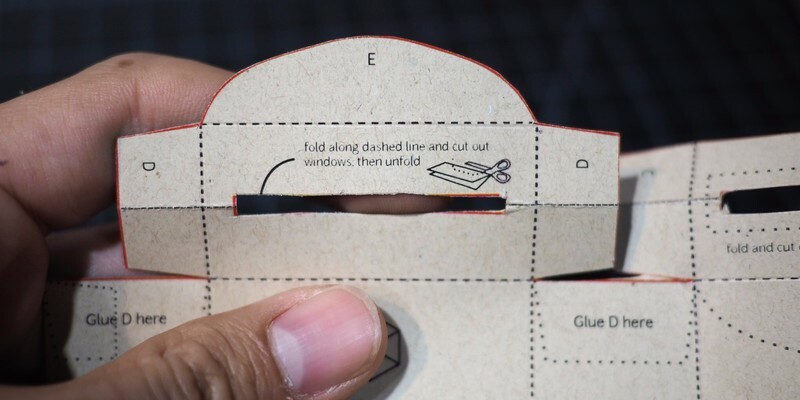 This page guides you through assembling this new design; also check out this page for related resources and activities. Keep in mind -- this is the "introductory" design intended to onboard newcomers to the project, so we're trying to make it as easy as possible to build. Once you've made this, you're ready to move on to more complex projects, like scanning, sample preparation, and more robust designs. We haven't gotten all the way there on every goal -- we'd hoped to make a version that required no glue -- just locking tabs -- but we just couldn't keep it small enough to be printed on a folded-in-half letter sheet. See this note, this, and some of these photos for my process of integrating all these changes, and see this page for some of the many many people who've contributed. don't jam up your printer! 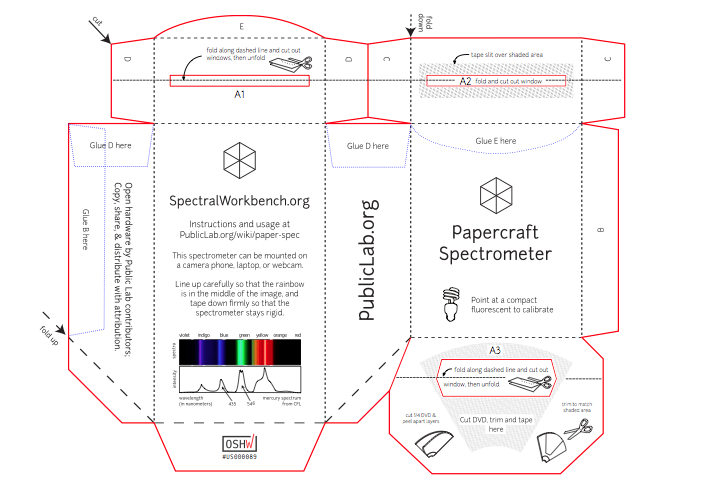 Note that if you print or paint black ink over the reverse side, the interior of the spectrometer will be darker; you can also color the back side with a black marker or ink. You can also print it onto thin white paper and glue it onto a sheet of thicker black paper. This will make it easier to fold evenly. A dull knife or the back side of a butter knife works well - just don't actually cut the lines! It's more like slightly crushing the paper, ideally. 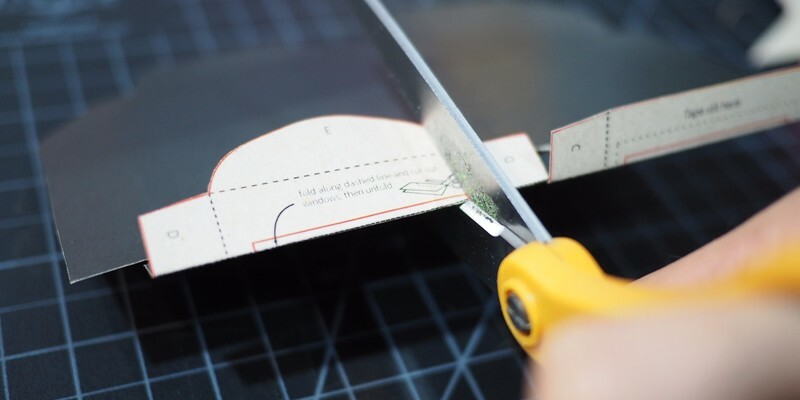 This was our attempt to make it easier to cut out the holes in the center of the page without using an Exacto or box knife or a nail; it's not perfect so if you have a paper knife and mat, go for that. Now, take a DVD-R and (really!) cut into it as you would cut a wide pizza slice. Once you have your slice, carefully peel the opaque layer away from the purplish transparent layer; keep the transparent one. Try to get a piece with no foil on it, especially near the outer edge. Firmly tape the slice onto the reverse (blank) side of the large hole you cut earlier. 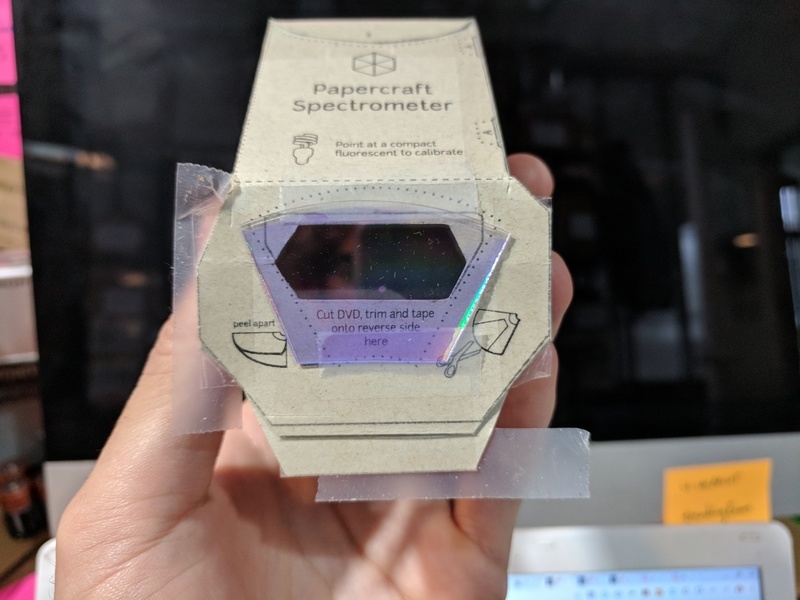 The kit we sell comes with a slit printed on photographic negative, but there's nothing special about it; it's just a narrow slit for light to pass through. (You can make your own with two pieces of black paper); trim as needed. See web link for more. 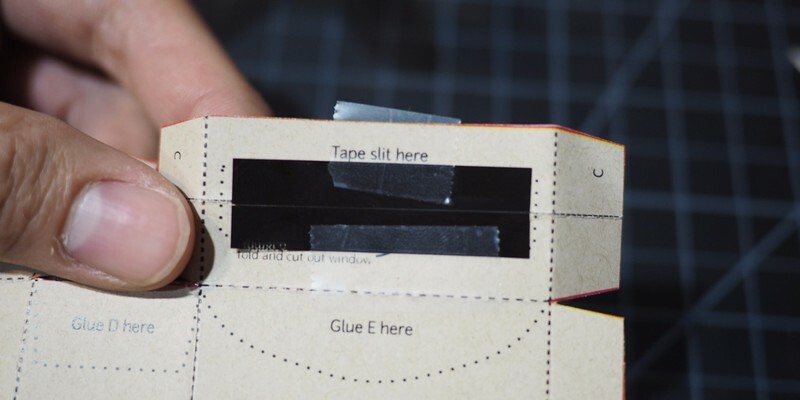 Here we've used some adhesive dots; just be sure there's no open seams where light can leak in. 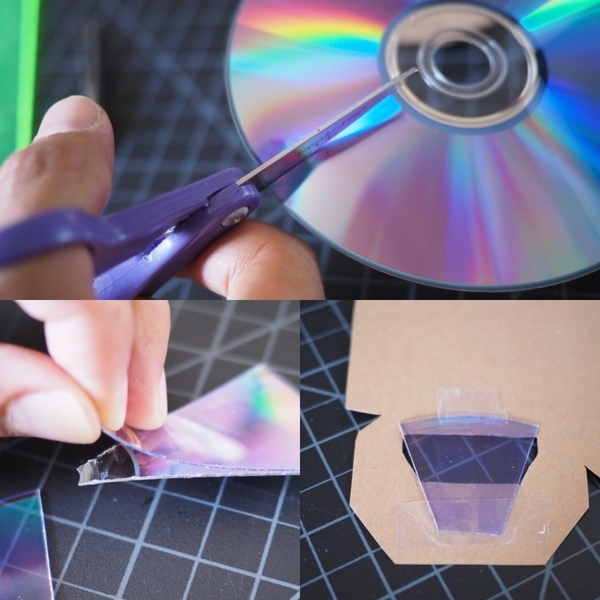 Fold the smaller side over the larger side and tape or glue the side shut. Now fold over and tape down the two overlapping front flaps -- first the one where you put the slit, then the other to cover and secure it. 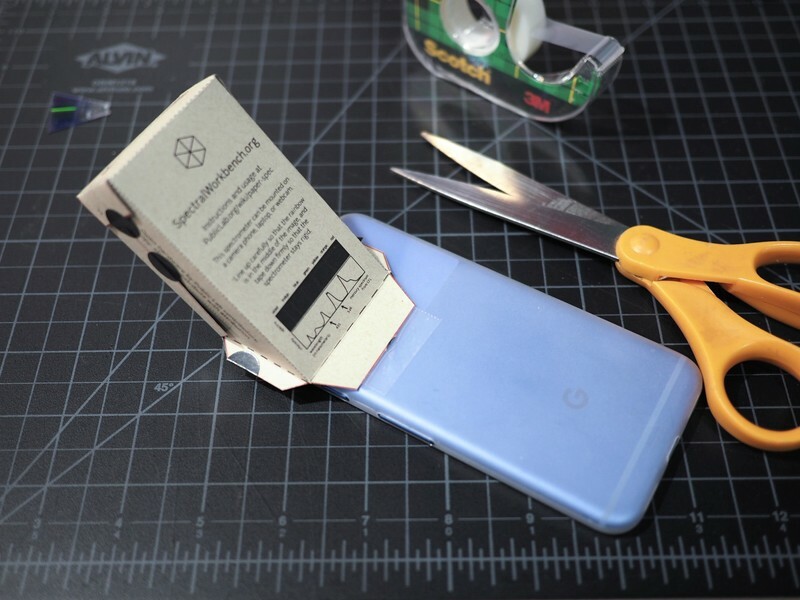 Finally, you can tape down the large diagonal flap on the back. 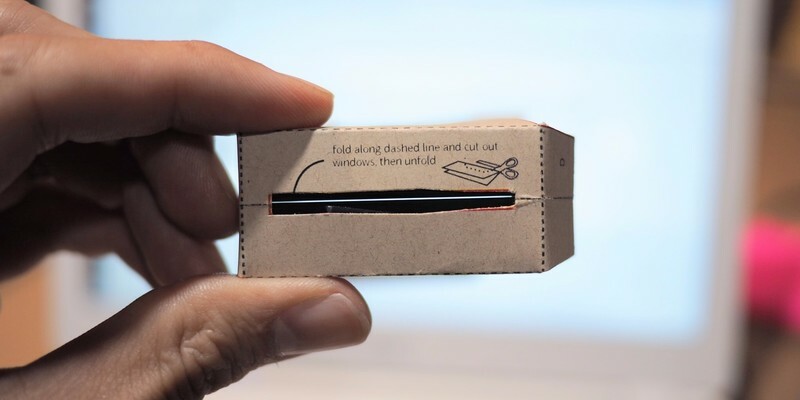 This is the surface you'll attach (tape, glue, whatever) to your smartphone or webcam. In this picture, I've taped the DVD on the outside instead because it kept getting pushed down when it was on the inside; I'm not sure which is better -- what do you think? 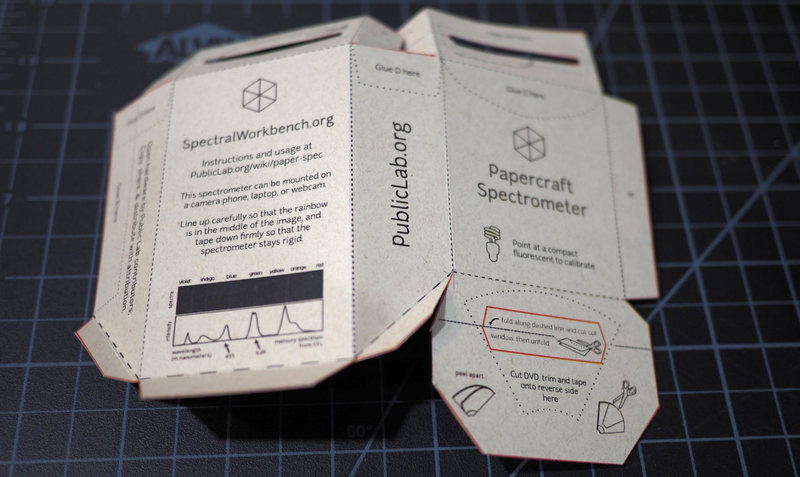 Now you're ready to attach it to your phone, webcam, or Raspberry Pi camera, and calibrate it using Spectral Workbench. Here's a convenient page to print a black square on the back!